Very Good. 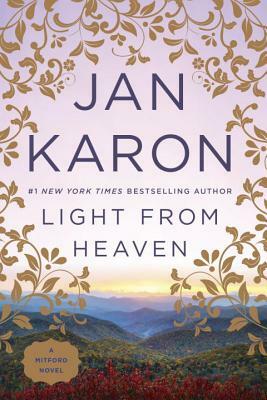 Light from Heaven (Mitford Years (Paperback)) by Karon, Jan. Trade paperback (US). Glued binding. 384 p. Contains: Illustrations. Mitford Years, 9. Good. Light from Heaven (Mitford Years (Paperback)) by Karon, Jan, 2006-10-31. Trade paperback (US). Glued binding. 384 p. Contains: Illustrations. Mitford Years, 9. Jan Karon writes as if she were talking to the reader. Her characters are so very real they jump from the pages. Father Tim looking for the hidden money in old car kept me from putting this book down for two days. Dooley finally receiving his great inheritance made me feel as if the money was real, and one of my close friends had received this wonderful blessing. I am sorry this is her last Mitford series book. Who knocked on the Father's door on the last page? I throghly enjoyed all the Mitford books. I was delighted with all of the content of this last book and would recommend it to anyone. Infact I would encourage everyone to get the whole series - they are worth reading over and over. enjoys a GREAT Christian novel. They are so down to earth and the author uses plain every day language. Read and enjoy.